Before, during, and after, only one thing matters: how does it make you feel? 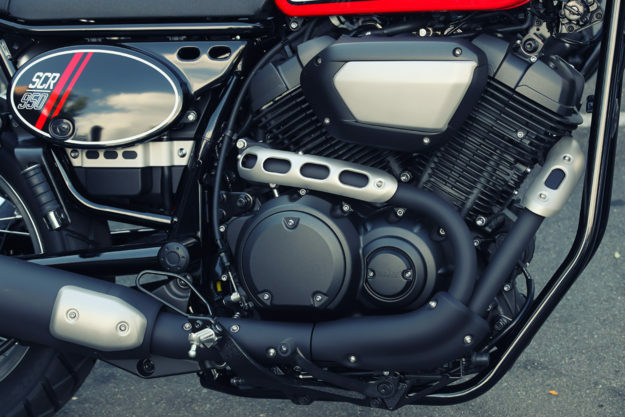 Tech specs can never do a motorcycle justice. The ride is the product. 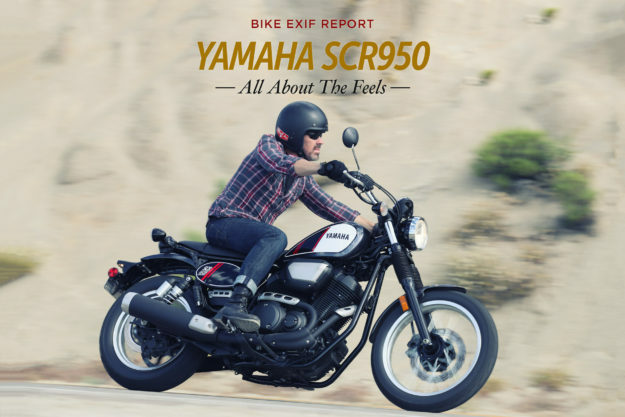 How I felt about the 2017 Yamaha SCR950 before was erased during. And how I felt after can be wrapped up in a word: hooked. This is the story of a changed mind. 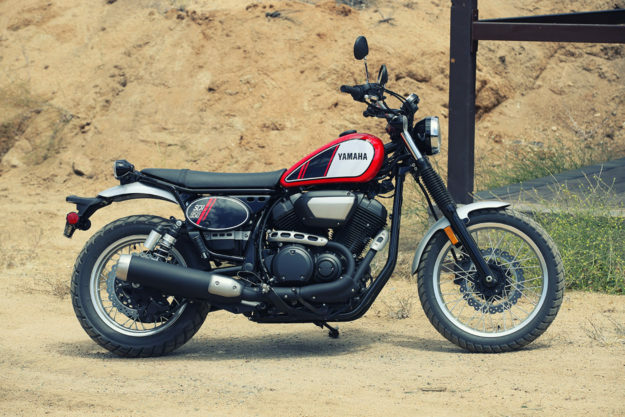 Before, I felt the obvious: the SCR950 doesn’t look like the scrambler of my dreams. That one has high pipes. It’s less visually dense all the way around. And its parts would be all tucked into a minimalist display that makes you want to go find a mountainside. So the first thing I’d want to do as an SCR950 owner is lighten it up, in both weight and looks—remove the air box, then swap out the 2-into–1 pipe, indicators, and anything else I could come up with. And, of course, the showroom version comes with what I like to call ‘giant bubble parts’—a de facto truth for stock bikes. In this case, that means plus-sized pipes and big ol’ turn signals and mirrors. I also felt like the bike’s weight was a question mark. 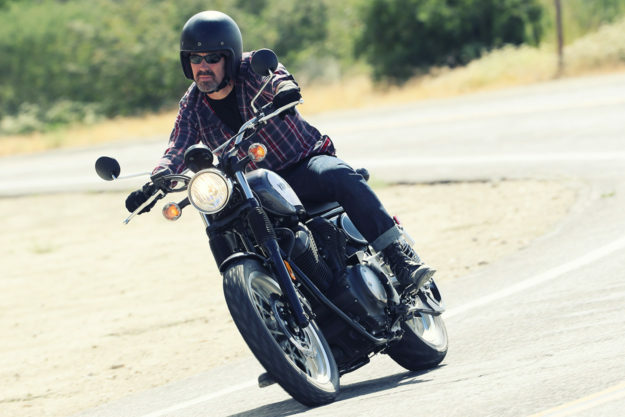 Could something that hits 547 pounds (248 kg) and packs a 942cc V-twin take a road like the little ruffians half that size? (For comparison, Triumph’s stock version sits in the neighborhood of 450 pounds). 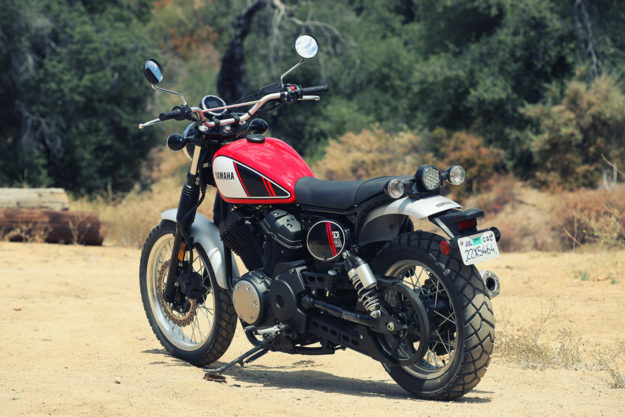 And could a bike that looks more like a Sportster than a trail-junkie scratch that scrambler itch? The during changed everything. Once I met the SCR950 and spent 110 miles or so with it on the super-twisty pathways of Julian, California, my outlook evolved. Because of how the bike made me feel. After the first minutes of getting used to the thing, it showed itself off in a thousand ways. It whipped from 30 mph to 80 mph in a heartbeat, and decelerated just as gracefully. This was key: Its low-end torque made it able to climb, drop, and climb again without ever breaking a sweat. I scrambled for miles in second gear and never once felt the need to shift. There was also enough squish in the suspension (a telescopic fork in front with dual piggyback shocks in the rear) to keep things generally smooth—with the exception of the occasional hard-hitting pothole, but that would brace you on any bike. By day’s end, I’d taken it around several dozen tight turns, a few miles of dirt, and a good 25 miles or so of back-and-forth on a goat road turned into a semi-paved single-lane made mostly of potholes and patches of gravel and dirt on the edge of a cliff. The bike never felt for a second like it was working. It did everything I asked without even raising its pulse, and seemed to do so without any real effort on my part. Tight turnarounds could be iffy, that said, unless you can keep a foot firmly planted on the ground. Most of the bike’s weight is in its lower half, so I found myself muscling it back to vertical on a couple of occasions—while attempting a U-turn on a hillside, for example. On a critical note, the SCR950 likes to jump when popped into gear from a stop, a fact that caught me off-guard every time. 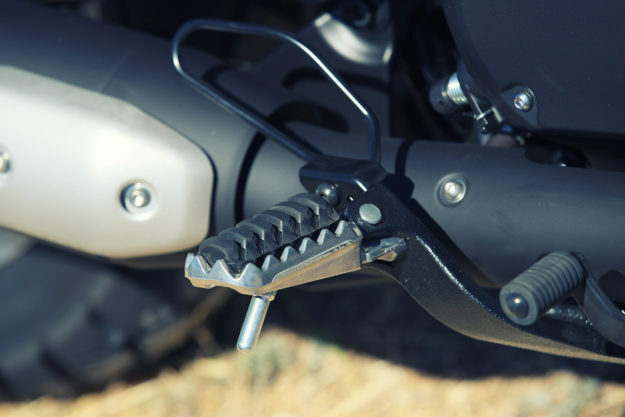 And the foot peg position can be both good and bad: bad because it was far too easy to whack my shins into them at rest, and good because they meant I could stand straight up when in scrambling mode. At higher speeds, a noticeable whirring sound showed up, presumably due to wind riding through the underside of the fuel tank. There was also a slight buzz in the engine during hard acceleration. But none of this affected the performance; this horse sped up on demand, and responded as if it was hardwired to my thoughts. 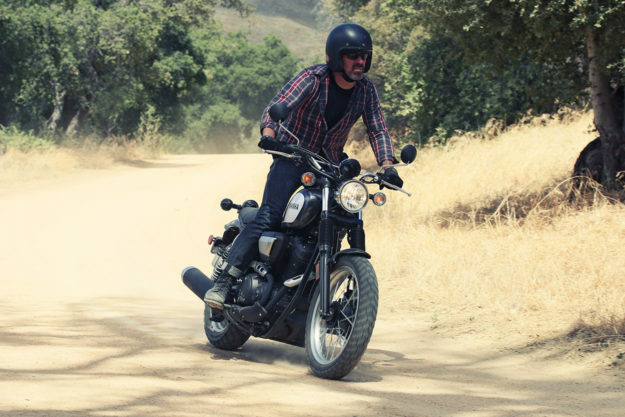 While the low, upswept pipes break from scrambler purism—even Yamaha’s own tradition, in many cases—they never touched ground on tight bends or over eroded asphalt.